I finally got a bit of time to blog today after a very busy few weeks. My kitchen has been in full operation. I have repeated some of my recipes, tried out new ones, brushed off the cobwebs from a few and are ready for trial run but time just doesn’t seem to be enough. So many of my recipes are ready for blogging. I was suppose to blog at least 3 to 4 recipes everyday since Ajay left for India but on the contrary have not managed even 1 and in a week’s time Ajay will be back home! 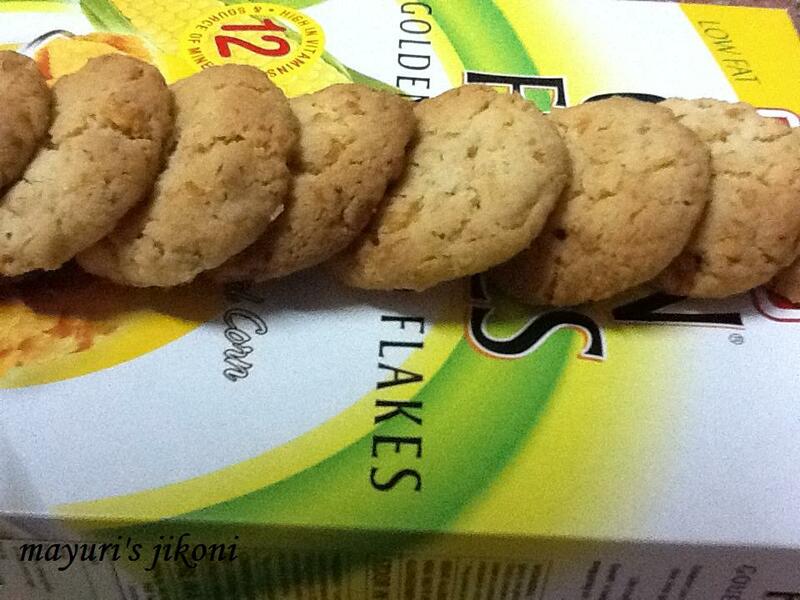 I tried out the recipe for cornflakes cookies twice and both times friends and relatives have enjoyed the cookies. My son Niku thinks they taste like popcorn. They are crunchy and ideal to dunk in milk, tea or coffee. What I love about making some of these cookies is that its really easy and make a great gift item. Sieve flour and baking powder together. Add the crushed cornflakes and mix well. Cream butter and sugar together till it is light and fluffy. Take about a tablespoonful of the dough and roll it into a ball. Flatten it slightly between your palms. Repeat with the remaining dough. Make sure the cookies are at least an inch apart as they will spread a bit. Place the cookies in the oven to bake for 12 to 15 minutes or till they are light golden in colour. Leave the cookies on the baking tray for 5 minutes and then remove them and cool them on a wire rack. Add vanilla extract instead of lemon juice. Add about ¼ cup chopped nuts to the dough. If the dough is too soft to handle, leave it in the fridge for 15 to 20 minutes and then roll into balls.